It was a busy year for the social media industry. In 2013, we saw the teen demographic leave Facebook for other networks that better capture their attention and don’t yet have the entire family engaged. Twitter added video to its repertoire by purchasing Vine, the mobile video app, on top of the announcement that it’s going public. In response, Instagram added video, and more recently launched sponsored images in users’ newsfeeds. Finally, as a fellow coworker pointed out, 2013 is arguably the year when GIFs hit it mainstream, bringing humor and creativity to social activity. With all of the changes, announcements, acquisitions; what can we expect next year in the digital world? 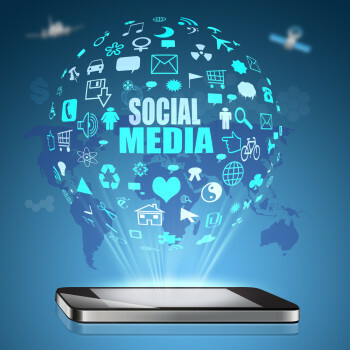 Below are my three key trends to keep an eye on in the social media space for 2014. The platform is still not taken as seriously as it should be, but 2014 will be a year of substantial growth for this underrated platform. Aside from the SEO benefits, Google+ offers a lot of functions that other networks don’t have, such as Communities, Hangouts and the ability to share specific content with targeted groups – not to mention its obvious connection to the world’s number one search engine. On both my personal account and the company pages I manage, I have witnessed an enormous increase in interaction on Google+. Engagement has risen, and with it, so has the ability to build circles as more people join the network. The speed at which you can gain followers on G+ still doesn’t compare to Twitter, but steady growth seen throughout the past year should only go up as people continue to incorporate Google+ in their daily dose of social. 2013 was also the year when G+ introduced us to Communities. These are very similar to the Groups feature that LinkedIn offers, but I have personally seen greater success participating within G+ communities than LinkedIn Groups. Before Communities began, it was hard to promote interaction on the platform, but engagement and follower growth has consistently increased since they were introduced. Google rolled out a number of updates that will make the social network more user-friendly for 2014, including improved local sharing, a better way to share visual content and other new features to improve curation. If your business has not yet dived into the platform, the turn of the New Year is the perfect time! One session that stuck out was the Future Trends in Tech and Social Media, presented by Howard Tullman, General Managing Partner for G2T3V. He introduced me to the idea of SoLoMo. A combination of the words social, location and mobile, SoLoMo explains where the digital world is heading and how to best share content with audiences in the future. Obviously, social is a key part of sharing and distributing content, but moving forward, location and mobility are going to be key to the formula. We always talk about how “Content is King,” but Tullman went further to say that context actually trumps content – an idea I agree with somewhat. The digital space is evolving rapidly, and to be successful, content must be proximate, relevant and in the right location. Mobile is becoming an increasingly important platform for marketers, with over 133 million registered smartphones in the U.S. This statement might be met with some pushback, but watch for Snapchat to be the breakthrough social platform of 2014. I’m not saying that it’s worth $3 billion, but it does offer many possibilities and it could be a source of untapped consumers for your company. Some brands have already seen this and are moving forward. 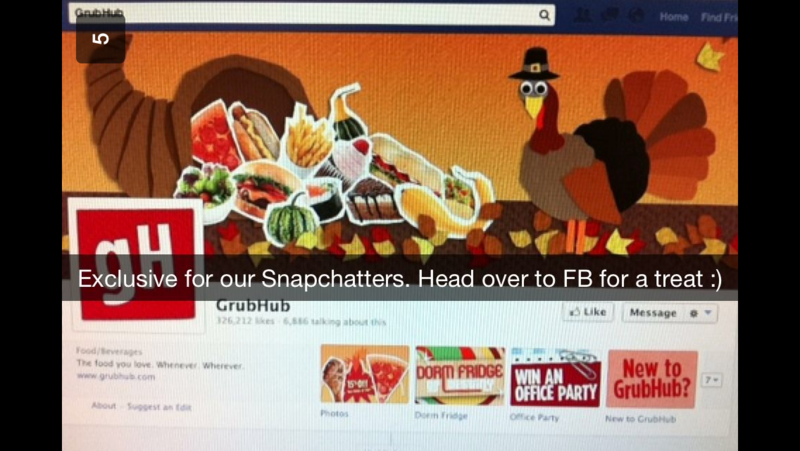 The online food ordering company, GrubHub, has been extremely creative with Snapchat. The campaign has given the brand a personality on social, helped it to stand out and encouraged follower engagement. 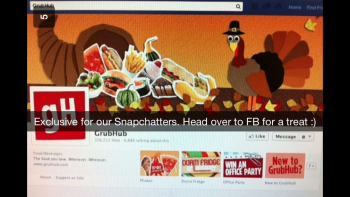 GrubHub uses Snapchat to drive people back to other social platforms, display discounts and revealed what goes on behind the scenes at the company. I have received holiday-themed snaps for Halloween and Thanksgiving, as well as general promotional snaps. These are all great examples of how GrubHub is using the channel to relate to consumers and produce relevant content. As a sports fan, I also recommend following the New Orleans Saints on SnapChat. The team offers an exclusive look into what goes on in the locker room, and it also sends fans messages from individual players. As my coworker, @laurenekstrandk, mentioned earlier this month, image-based updates have 600 times higher engagement rates than posts that contain only text and video content is close behind. This gap is only going to get smaller moving into 2014. Whether it’s infographics, GIFs, still images or video, visual content is driving more interaction throughout social. This is not to say that text or other content types aren’t worth sharing, but visually appealing posts are likely to become the bread and butter of content strategies. Let’s be honest, plain text can be downright boring at times, hence why adding visual content to online strategies, posts or blogs is extremely important. This captures reader attention and keeps visitors engaged. Eighty-nine percent of people between the ages of 18 and 34 watch online video content once a week and in 2014, this number will easily surpass the ninety-percent mark. I also wouldn’t be surprised if this demographic expands to a wider audience. Not only will visual content be vital to successful strategies, but so will personalization. Businesses that go the extra step to tailor content will better resonate with consumers. I’ve been all about GrubHub’s social strategy, so I will stick with that and explain how personal content has turned me into an advocate. For fun, I sent GrubHub pictures on SnapChat just to see if it had generic responses or responded at all. On two separate occasions, GrubHub sent me personalized snaps in return. Once, I snapped a picture of my lunch not expecting anything back (being a business in the food industry, I thought it was necessary to keep it relevant). 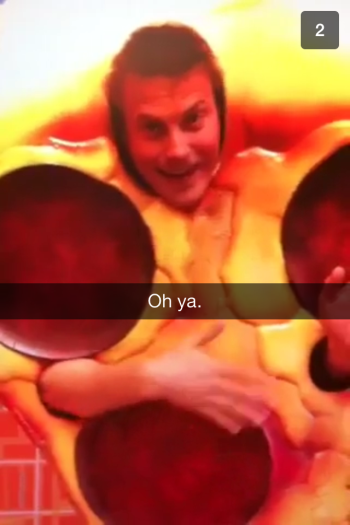 Within a few hours, I received the snap below of an employee dressed up as a Pizza, rubbing his stomach with the text that read “Oh ya.” As simple as this seems, it’s an example of outreach that could go a long way to make consumers brand advocates! The social space is constantly changing, and what might be a hot topic today could be old news tomorrow. These three trends are just some of many that will be important for marketers moving into the New Year. There will certainly be new topics, networks, apps and ideas in 2014 that marketers haven’t even thought of yet, and that is what makes this industry so exciting. I look forward to hearing what trends you are most looking forward to in 2014! Ty is a Social Media Manager at Brafton and currently lives in the north end in Boston. When he is not working he enjoys traveling, playing sports, listening to music and attempting to cook.